Keeping your horse's feet healthy is key to keeping him sound. Abscesses in the hoof are typically characterized by sudden-onset, severe lameness. In some cases, the horse may refuse to put any weight at all on the affected hoof. The horse will be sensitive in the area of the abscess and may have an increased digital pulse and swelling in the lower leg. A vet or farrier can pare away the hoof to reveal and drain the abscess, confirming the diagnosis. If left untreated, the abscess may erupt on its own through the sole of the hoof or at the coronary band. A hoof abscess is a pocket of infection in the lamina. It can start with a puncture wound caused by the horse stepping on a sharp object in the barn aisle, or a misplaced horse shoe nail. The hole allows bacteria to enter the hoof, where it thrives in the warm, dark environment. While the bacteria eat away at the hoof tissue, the horse’s immune system attacks. The resulting pocket of bacteria, white blood cells, and dead hoof tissue puts pressure on the sensitive structures of the horse’s hoof, causing the pain response. Once the vet has located and drained the abscess, the key is to keep the area clean to avoid reinfection. The hoof should be soaked in a solution of Epsom salts in warm water to help draw out any remaining infection. The hoof should be kept bandaged until it has healed. 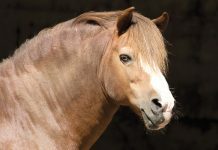 A vet may suggest an anti-inflammatory, such as Bute, to manage the horse’s pain. The recovery period is typically no more than a week to ten days, but this can vary widely depending on the severity of the abscess and the owner’s ability to prevent reinfection. A horse with a bruised hoof can show varying degrees of lameness. Some will only be off only on uneven or rocky surfaces while others may be consistently lame. A sole bruise may show up as a visible mark, but a horse will usually show lameness or sensitivity before the bruise actually appears. In some cases, the bruise may not be severe enough to cause lameness, but the horse will be sensitive to hoof testers or concussion at the affected area. Bruises on the hoof and frog are very common. 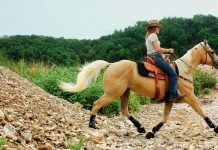 The most common cause is when the horse steps on a rock or hard, uneven ground. Crusty, icy snow can also lead to bruises. Regular work on arena footing that is too hard can also cause bruising, as can taking a horse that is primarily ridden on soft footing and working him on hard ground. Improper farrier work can also lead to brusing. If your horse is showing signs of brusing, have him stand with the affected hoof in a bucket of ice water. This will prevent the rapid blood flow to the area that causes bruising. In more severe cases, a vet may suggest treatment with an anti-inflammatory medication such as Bute. You can reduce the risk of bruises by being diligent about picking your horse’s feet daily or before and after every ride to remove any rocks that may be stuck in his hoof. Keeping his feet clean and dry will also help, as wet soles may be more prone to bruising. If you have regular problems with bruising, your farrier can add a pad between the hoof and the shoe to protect the sole. Some endurance and competitive trail riders outfit their horses with protective boots that cover the entire hoof when competing on long rides or over especially rough terrain. These boots can prevent bruises and other hoof injury while giving the horse some extra traction. A crack in the hoof wall originating at the coronary band is known as a quarter crack when it occurs on the side–or quarters–of the hoof. Toe cracks may also occur, but are less common. These cracks typically begin on the inside of the hoof, where they are not visible, and become obvious when the crack reaches the surface of the hoof wall. Affected horses will not always be lame, but if the area becomes infected, it can cause severe pain. Cracks can be caused by trauma to the coronary band or heavy concussion, such as work on hard surfaces. Horses with weak or thin hoof walls are more prone to quarter cracks. 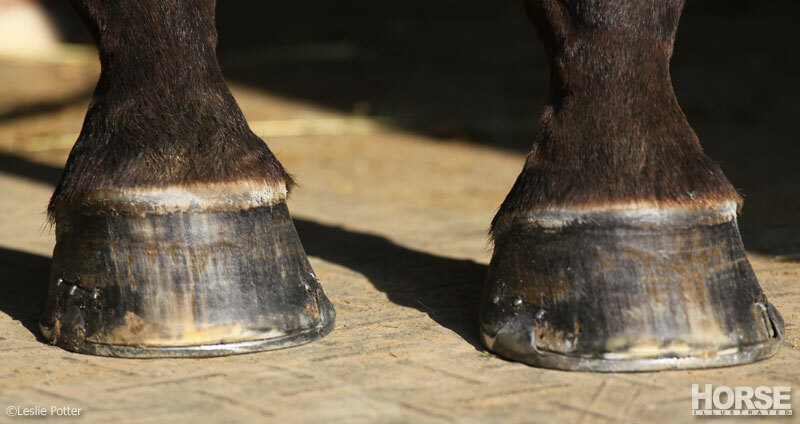 Poor hoof conformation or an improper trim—especially long toes and underrun heels–can also lead to cracks. Quarter cracks can affect any breed of horse in any sport, but tend to be more common in race horses. 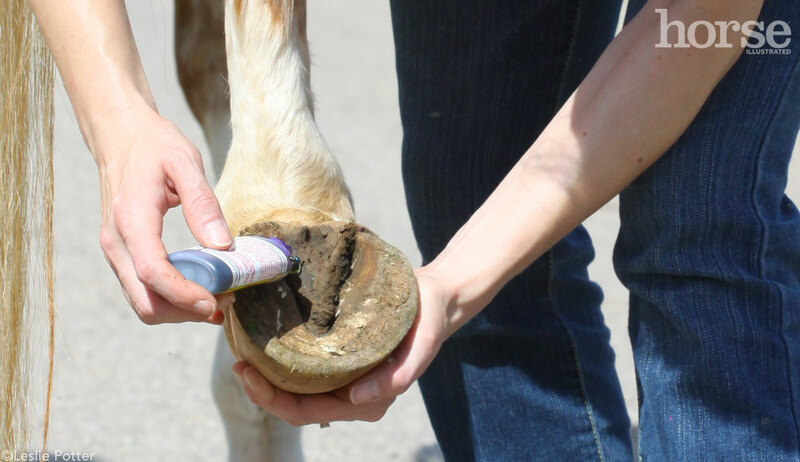 If the hoof is infected, your vet will open the crack to disinfect the area and remove any dead tissue, if necessary. In some cases, the vet will repair the crack using screws, staples, or wire lacing. The horse will usually require special shoeing to relieve pressure while the crack heals and begins to grow out. In most cases, your vet will cover the crack with an acrylic patch to reinforce the repair. Laminitis causes varying degrees of pain. It can affect one or two or even all four feet, but is more common in front hooves than back. A laminitic horse may shift his weight back and forth or stand with both front feet stretched out (often referred to as the sawhorse stance) in an attempt to take weight off of his hooves. The affected hooves will be notably warm or hot and the digital pulse will usually be elevated. If made to walk, the horse may move in a hesitant manner. There are numerous causes for laminitis. The most common scenario is one where the horse is let out into a lush, spring pasture and gorges himself on rich grass. The high-carbohydrate, easily digestible spring grass is broken down rapidly by the bacteria in the horse’s gut. This fast digestion causes a byproduct which is absorbed into the horse’s bloodstream where it become a sort of toxin, causing inflammation in the laminae. This same scenario can play out in situations where the horse has broken into the feed bin and gorged himself on grain. Other causes include heavy concussion (such as a horse that gallops or is worked at a high-stepping gait on a hard surface), retained placenta in broodmares or a hard workout without appropriate cool down. Exposure to environmental toxins such as black walnut can lead to laminitis. Obese or cresty horses are more prone to laminitis than fit and thin horses, but any horse can be affected. Laminitis can also become a secondary issue if a horse is compensating for an injury on one leg by putting most of his weight on another. This was the widely publicized case with 2006 Kentucky Derby winner Barbaro. If laminitis is caught early, standing the affected hooves in ice water can slow the progression of the disease. Your vet will most likely prescribe an anti-inflammatory such as Bute to help relieve some of the pain. Some vets will also apply DMSO to the affected legs as it is believe to help increase blood flow to hooves, but it’s effectiveness has not been conclusively proven. Your vet may suggest special shoes to help relieve pressure on the affected area of the hoof. Horses that have had laminitis in the past are more prone to it in the future, so proper management is key. The horse should be kept off grain, grass and rich hay during the recovery period. Some vets will suggest soaking grass hay before feeding it to laminitic horses. Overweight horses are more prone to founder, so keeping your horse on a strict diet even after he has recovered may be necessary. Old Hay: Is it better for laminitis? Thrush is a bacterial infection that primarily affects the sulci (grooves) of the Frog. The infection causes a gooey black discharge with a distinctive foul odor. In most cases, thrush will not cause significant pain, but if left untreated it can cause sensitivity in the frog and heel and ultimately lead to lameness. Thrush can happen to any horse when conditions are favorable, but horses with deep sulci or contracted heels tend to be more prone. In most cases, a horse owner can treat thrush quickly and easily by applying a commercial thrush medication to the sulci. A 1:10 mixture of bleach and water can also be used. Picking your horse’s feet regularly, keeping your stalls and paddocks clean, and making sure that your horse has somewhere dry to stand in the pasture during wet months are the keys to prevention. This may require putting up temporary electrical tape or wire fencing to keep horses out of flooded or muddy areas of the pasture. If the infection has advanced enough to cause pain or sensitivity, your vet may trim off any dead tissue to expose the infection, then pack the hoof with antiseptic-soaked cotton. In rare cases, a vet may prescribe antibiotics. The infection that causes white line disease is anaerobic, meaning it lives in an environment without oxygen. Your farrier or vet will remove the hoof wall in the affected section to expose the bacteria and fungi to oxygen. The affected area must be thoroughly cleaned to get rid of the bacteria, fungi and dead tissue. Your farrier will outfit the your horse with a supportive shoe while the affected area grows out. If the pocket of infection was low on the hoof, you may be able to keep your horse in light work while he recovers. If the affected area is near the coronary band, it will need to grow out before the horse can be ridden again. Keeping your horse’s hooves clean, maintaining his stalls and pastures and keeping him on a regular farrier schedule are the best ways to prevent white line disease. ugh my horse ALWAYS has bad thrush…i’ve tried so many different treatments but now I think I found one that works. Thank you for the informative article, it would be so much more helpful if there were photos to show exactly what these problems look like, for those of us who are not ferriers. Worth my time. Just the right length for a quick skim to learn something new. Organized and useful. Thank you. Excellent article! This is one that should be printed off and kept in the barn for those times when an emergency arises. My boyfriend and I run a lesson/boarding barn in Upper New York State. He has been a farrier for 30 years. We have never seen so much laminitis in the past as we do now. We believe that all the new fancy formula feeds may have something to do with it. There seems to be so many odd ingredients added to the feeds nowadays and maybe they are not very good for horses? Maybe it’s the pesticides used on the grain growing fields? We’ve gone back to feeding almost exclusively hay to our herd and lately haven’t seen too many problems in our own horses (and boarders)…until a brand new boarder comes in and there it is again! My horse has damaged her hoof on the top very middle and some of the nail/hoof is is gone. Does it need to be filled in and if so with what? It kinda reminds me of a hold in drywall that needs to be packd and fixed. Liked Susan’s of NY comment. Our horse developed hoof problems last year because of all the moisture we got a lot of rain a lot a lot. The farrier said she has made some improvement. Any suggestions on what we can do to help her hooves recover. The cover photo for the article on hoof problems showed one of THE worst shoeing jobs I have ever seen! A shoe nailed to a widely flared hoof wall, no way was the horse properly supporting its weight on such a mess. While I do practice barefoot care on my horses, I also say if someone feels they need to shoe their horse, fine, but do so on a properly trimmed and prepared hoof. Whoever the farrier in this case was should be disbarred from ever practicing the craft. Really a question.My carrier said my horse has white line disease and recomends using hot shoes. Is this a good idea? Has anyone had a problem with hoof shelling on both sides. Cannot keep shoe on- Have to glue shoes on and when taken off part of the hoof wall comes off with it. Help – its not just seasonal but year round. Other horses are fine. Great article. These kinds are the best. Lots of good facts and ideas, but it is so hard to keep pasture horses’s hooves clean, special in the spring, when 99 percent of the pastures are mud. The best way to get rid of an abscess is to give your horse Clorpactin. Clorpactin can be bought over the counter. It’s a bit pricey, but worth it. Our horse Rocky was okay until our farrier came out to trim his feet. We have snow on the ground and we were told by our farrier that the frog wouldn’t be trimmed just the hoof. But now our horse just stands in one place picking up one foot, then the other and so on. We’ve had record snow so it isn’t easy to get him transported down to the vets in the valley. We put a large rug down in the snow for him to stand on, but he doesn’t want to. Our other horses are okay after their trims, but they have dirt to stand on….we cannot put them in together because Rocky fights with the others.Is this something you can help me with as we are very worried about him.